Weather processes such as wind, clouds, and precipitation are all the result of the atmosphere responding to uneven heating of the Earth by the Sun. The uneven heating causes temperature differences, which in turn cause air currents (wind) to develop, which then move heat from where there is more heat (higher temperatures) to where there is less heat (lower temperatures). The atmosphere thus becomes a giant "heat engine", continuously driven by the sun. High and low pressure areas, wind, clouds, and precipitation systems are all caused, either directly or indirectly, by this uneven heating and the resulting heat redistribution processes. (1) VERTICAL heat transport: Solar heating of the Earth's surface makes the atmosphere convectively unstable, causing vertical air currents to develop. This is what causes puffy-looking clouds, showers, and thunderstorms to form in warm air masses. (2) HORIZONTAL heat transport: Because the Earth is a sphere, it receives more sunlight in the tropics, and less sunlight toward the North and South Poles. This causes horizontal temperature differences to develop, which in turn causes air pressure differences, leading to wind that transports heat from the tropics to the high latitudes. Together, this uneven heating in both the horizontal and vertical directions in the atmosphere causes everything that we perceive as "weather". 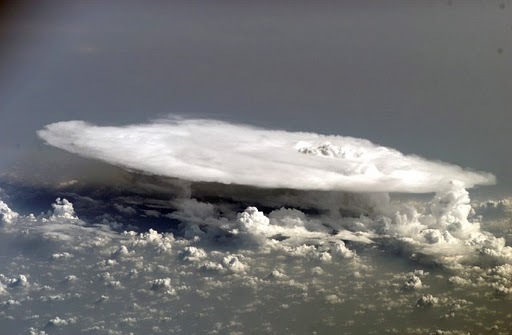 If there is very little surface water available (for instance, in deserts), the convective overturning of the atmosphere is called "dry convection", and it does not produce clouds or precipitation. Temperature differences caused by uneven solar heating between different regions causes high and low pressure areas to develop. 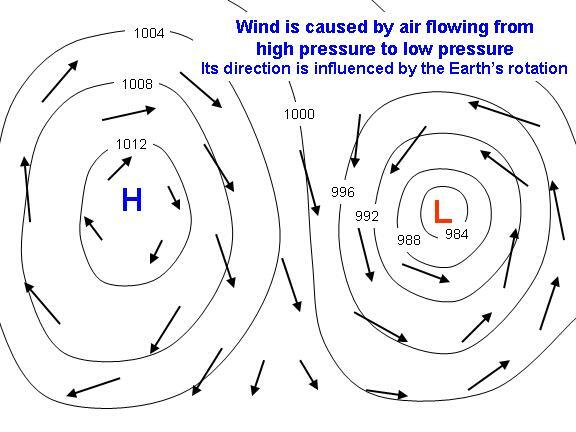 The horizontal transport of heat by wind from low to high latitudes is strongly influenced by the Earth's rotation, which prevents the wind from flowing directly from high pressure to low pressure, and instead causes the wind to flow around high and low pressure centers. The following example shows how the wind flows in the Northern Hemisphere...in the Southern Hemisphere, the wind flows in the opposite direction around high and low pressure areas. This diverting force is called the "Coriolis effect". 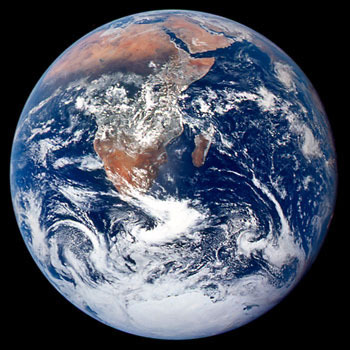 The spiral shape of cloud systems can be clearly seen from space, such as in this famous photo taken by Apollo 17 astronaut Harrison Schmitt, and is evidence of the Coriolis effect. All of these horizontal and vertical heat transport processes produce complete atmospheric circulation "cells". This is a consequence of the fact that for all of the air transporting heat from higher to lower temperatures, there must also be a return flow of air in the opposite direction. For instance, for all of the air rapidly rising within a thunderstorm, there must be an equal amount of air sinking elsewhere. This sinking occurs over a much broader area than the strong updrafts in the thunderstorm, and the rate of sinking is more slower. This is why you feel turbulence when flying through clouds, but not so much in the clear areas around the clouds. The distances involved in the circulation cells is typically tens of miles. 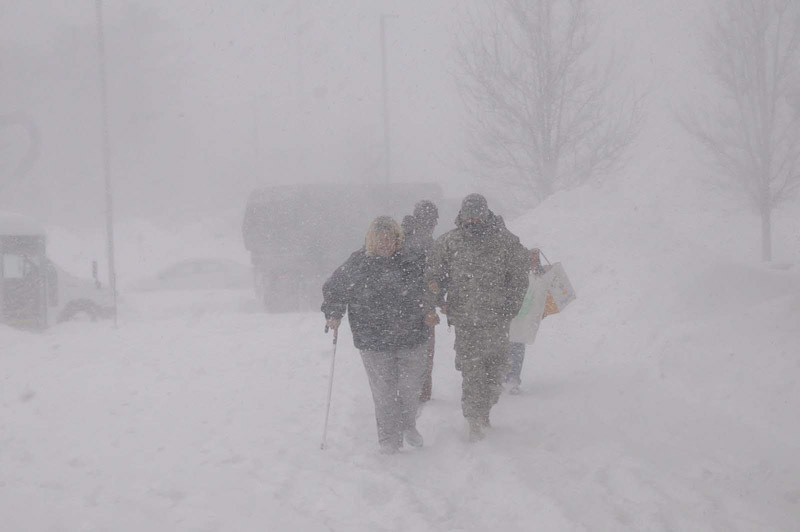 In the winter, and at high latitudes, the circulation cells cover much much larger regions. The slowly ascending air within cloud and precipitation systems associated with low pressure areas covering areas hundreds of miles across forces an equal amount of air elsewhere to sink, which usually occurs in the high pressure zones. So, when you experience a clear day without a cloud in the sky, you are in the descending branch of an atmospheric circulation cell. That descending air is being forced downward by rising air in precipitation systems hundreds or even thousands of miles away. Then, because these circulation cells tend to travel, in a day or two you find yourself in the ascending branch of a circulation cell, with clouds and rain (or snow). If all this sounds complicated, that's because it is. But remember, all of this complexity we experience as "weather" is ultimately the result of uneven heating of the Earth by the sun, and the atmosphere continuously 'trying' to reduce the resulting differences in temperature.